New York, NY – January 30, 2019 – Legendary, French sunglass brand Vuarnet, manufacturer of timeless sunglasses and the finest mineral lenses, announced today that they are introducing a goggle collection to the US market. News of this product expansion comes on the heels of the brand’s announcement that they are launching technical winter apparel. The collection can be previewed this week at Outdoor Retailer/Snow Show in Denver. Crafted in Italy, the Vuarnet Goggle collection features a double lens in polycarbonate. The cylindrical, anti-fog flash lens delivers an obstructed view while the triple density foam offers comfortable and secure fit. The unisex style is designed to complement the ski apparel collection and is available in five colorways pairing matte black, white, red or blue frames with bright flash lenses or a photochromatic amber lens providing maximum UV protection. Inserts are also available for prescription. To view the new goggle collection as well as Vuarnet’s latest eyewear and apparel, visit Vuarnet at Outdoor Retailer, Booth 51054-UL. 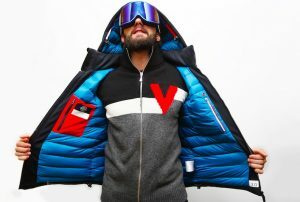 Founded in France in 1957, Vuarnet made its debut on the international stage when downhill skier, Jean Vuarnet, won the gold medal at the 1960 Olympics wearing the brand’s iconic cat eye. The brand soon grew in popularity outside of the ski world, reaching the height of its popularity in the Eighties when the VL 02 cat eye was THE style to own. Today, Vuarnet continues that legacy offering the highest-quality, sport-elegant sunglasses with the finest mineral lenses to deliver unparalleled protection, clarity, durability and style. The US collection reflects both the brand’s heritage as well as contemporary trends including: sleek metal aviators, updated glacier silhouettes, glamorous lifestyle sunglasses, and styles designed specifically for an active lifestyle. Recent brand collaborations have included rag & bone (2017) and NOAH (2018). us.vuarnet.com.